Glynwood was recently awarded a Sustainable Agriculture Research and Education (SARE) Partnership Grant to support its project entitled: Increasing Soil Health and Climate Resilience Education for Pasture-Based Livestock Farmers (SARE project ONE17-303). 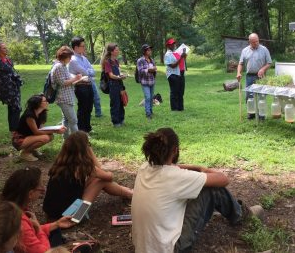 The project is led by Glynwood, in collaboration with staff from Cornell Cooperative Extension, Natural Resources Conservation Service (NRCS), University of Massachusetts Stockbridge School of Agriculture and regional farmers from Back Paddock Farm and Grass + Grit Farm. The purpose of the project is to increase the number of practical, tangible and meaningful opportunities to educate regional farmers about soil health and adaptive management via on-site demonstrations, regional workshop presentations and a soil health field day. Our SARE grant supports the development of a pasture improvement demonstration area at Glynwood’s Hudson Valley Farm Business Incubator, located at Mohonk Preserve in New Paltz. The demonstration showcases pasture improvement methods for common soil health constraints in our region, such as soil compaction and poor drainage. The pasture improvement treatments include application of limestone and compost, rotational grazing of ruminant animals, and the use of a keyline plow to mitigate soil compaction issues. The demonstration area includes sixteen plots with every combination of these treatments, plus a control plot. We sent numerous soil samples to the Cornell Soil Health Lab in the fall of 2016 for baseline data from which Glynwood staff and project collaborators will measure outcomes. Each fall, staff will sample soil for follow up analysis to measure the impact of the various treatment. Since implementing the project, we have conducted forage species counts in the treatment areas to collect baseline information about the native pasture plants. Over time, we anticipate an increase in the percentage of desirable species as we improve soil health in these pastures. The team has also conducted worm counts in the sixteen demonstration plots by digging up 1’ x 1’ sample areas. Worm counts in excess of 10 are considered an indicator of good soil health. Glynwood’s initial worm counts averaged 18.5 worms per square foot. We expect those numbers to climb as we mitigate soil health constraints. The second demonstration component of the SARE grant is the utilization of warm season annual forage as an effective strategy for improving risk management for graziers in the warm season. Glynwood staff recently seeded a mix of brown mid-rib (BMR) sorghum, pearl millet and crimson clover to be grazed by cattle during the hottest stretch of the summer. Pastures in our region are composed predominantly of cool season perennial plants, which slow down in the summer. Too frequently in recent years, intense stretches of heat have forced area farmers to purchase hay when forage has been inadequate in the summer. Production of warm season annual forage is a way to create a backstop in the event of inadequate forage. Glynwood staff and partners will compare the cost of production and value of forage against the market rate for hay in the mid summer. Glynwood looks forward to reporting on progress in Increasing Soil Health and Climate Resilience Education for Pasture-Based Livestock Farmers. For more information on pastured livestock operations, please read our report Pastured Protein: Ecological, Humane and Healthy Meat from the Hudson Valley.